Laryngoscope Equipment (larynx scope) is a medical device that is used to obtain a view of the vocal folds and the glottis, which is the space between the cords. 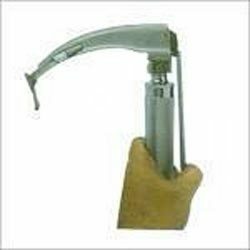 We manufacture laryngoscope that is safe for use in anesthesia/resuscitation for end tracheal intubation. The laryngoscope Equipment is inserted into the mouth on the right side and flipped to the left to trap and move the tongue. This device is made from high grade material for giving long lasting service. Made from medical grade stainless steel, English Profile Blade are available in different finish sizes to provide suitability for infant, child, adult patients. Available in matt or gloss finish, these Macintosh blades feature stainless steel or brass construction and can be fixed on handles also featuring two size 1.5 V cells for providing conversion from lamp to fiber optic illumination. 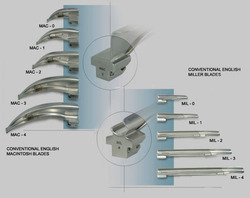 We can offer the blades as per the needs of different size handles. Some of its features include providing for unobstructed viewing, offering anti-seize spring action, fitting support on all hook-on handles among others. Available in medical grade stainless steel finish, these Penlite-Handle find use in holding Macintosh blades securely while handling the process of visualizing epiglottis and facilitating insertion of E/T Tube. Being 100% auto-clavable, it is supported by 2.5V Halogen lamp, space for using 2 "AA" batteries and sterilization option for outer compartment of handle with any approved EO gas sterilization cycle. We offer these handles at competitive prices. Laryngoscope is an instrument used for viewing the vocal folds and glottis, a space between cords. We manufacture these using premium quality materials that are sourced from the reliable vendors in the market. These are widely used in diverse endoscopic and surgical applications. Clients can avail these at nominal prices and are highly demanded for their varied features and excellent service. 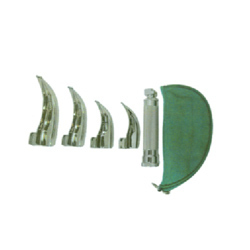 This Laryngoscope Blades with Handle & Pouch is widely applicable in different surgical processes related to vocal cord infections. It is made of finest quality tested materials and according to the international quality standards. We offer these at competitive prices in the industry. These are available in various specifications and can be customized as per the requirements of the clients. Looking for Laryngoscope Equipment ?